It’s all about connections. Connections to places, connections to people, and connections to the resources that will make your ideas work. Once upon a time in Atlanta, a group of people started talking about a good connection they didn’t have. The Midtown area had invested in bicycle lanes on 5th Street to get riders from the residential neighborhoods to the business district, rail system and Georgia Tech. Georgia Tech, spurred by students and staff, had committed to more bicycle facilities and begun striping bike lanes and installing sharrows around campus. But the unusual design of the intersection of 5th Street and West Peachtree made for a bad connection, one forcing cyclists to go three blocks out of their way, ride on sidewalks, or merge across four lanes of fast traffic. It was unsafe and inconvenient and discouraged people from riding their bikes to get around. So to build a better connection, they started building connections. 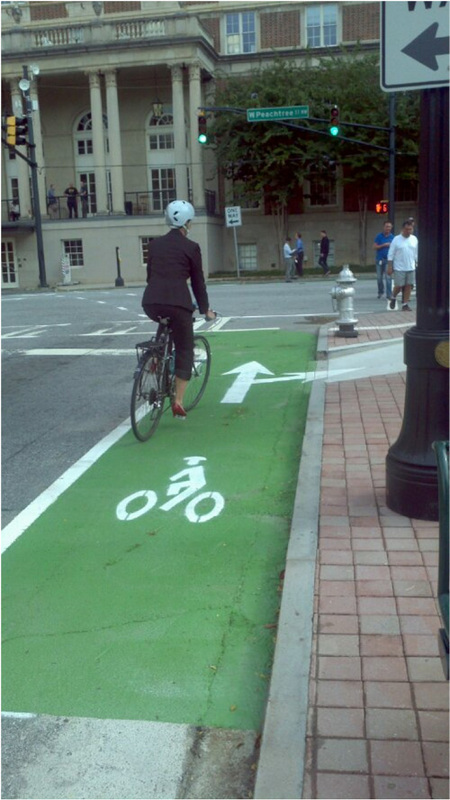 The Atlanta Bicycle Coalition and the City of Atlanta started talking. They reached out to Georgia Tech and the Midtown Alliance. The groups came together around a partnership grant application to PeopleForBikes with each one committing something tangible: money, staff time, or professional services like design and planning work. When an influential leader at one of the organizations voiced opposition to the project, the team again used their connections to find the right person to address the objections. They used connections to elected officials to gain support for the project and share credit as well. When the project went over budget, the personal relationships the team had developed helped them find the money to cover the cost. The end result? A beautiful connection with the City’s first raised cycle track and bicycle traffic signals that makes the intersection safer for people on bikes and in cars. 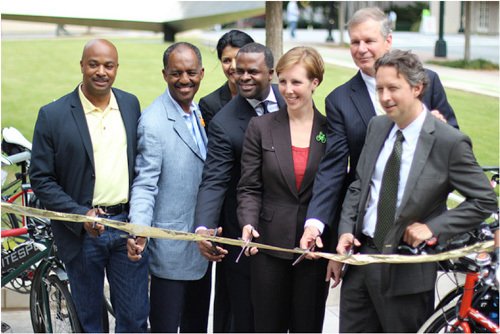 A ribbon cutting with a speech by the mayor saying this project made him a believer in the value add of cycling to the City of Atlanta. A celebration attended by two City Council members, the President of Georgia Tech, the CEO of Midtown Alliance, and the Executive Director of the Atlanta Bicycle Coalition — and, of course, lots of people who live nearby and ride their bikes. The really cool part? This project built a lasting connection between the partners who initiated it. They are continuing to work on bicycle improvements and have more, bigger projects in the works. Because after all, that’s what it’s really all about.